Here on 24th February 2019, we provide you DGIP Directorate General of Immigration & Passports Ministry of Interior Jobs 2019 Application Form Download | ots.org.pk. DGIP Directorate General of Immigration and Passports invites applications from eligible candidates to fill the following positions based at multiple provincial and regional Passport Offices in Pakistan. 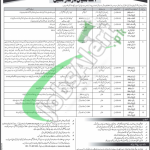 Immigration & Passport Jobs are (Assistant, Stenotypist, Printing Staff, Data Entry Operator (BPS-11) (05 Vacancies), Data Entry Operator (BPS-11) (74 Vacancies), UDC, LDC, Driver (BPS-05), Driver (BPS-04), Naib Qasid, Chowkidar, Farash, Sweeper) for Punjab, Sindh, Balochistan, KPK/FATA and Azad Kashmir/Gilgit-Baltistan. Appointment of these positions will be on contract basis and duration of the contract is extendable on satisfactory performance of an individual. DGIP invites applications from the residents of the relevant district of the relevant province of Pakistan. DGIP is an abbreviation of Directorate General of Immigration and Passports which is working under Ministry of Interior Government of Pakistan. DGIP is responsible for the issuance of Passports to citizens of Pakistan and visas to the foreigners. Passport office jobs are Government sector jobs announced once or twice in a year and current Passport office Jobs 2017 can be examined from this page with complete information. Qualification: Candidates possessing qualification from Graduation / Intermediate / Matric /Middle/primary is required in the relevant discipline as per the demand of vacancies. Age: Applicants holding age from 18 to 28 years. Candidates may download an application form from www.ots.org.pk. Duly filled application form along with paid deposit slip of test fee and other documents should reach Manager Operation (DGIP) Open Testing Service Office No. 1, Central Avenue, Phase-VI, Bahria Town, Islamabad. The last date for submission of application is March 09, 2019. For Roll No. Slip, Test Date and Test Result can be checked on the official site of OTS. For more Government Jobs please visit our site JobsAlert.pk. Address: Manager Operation (DGIP) Open Testing Service Office No. 1, Central Avenue, Phase-VI, Bahria Town, Islamabad.